But, I've survived past holidays, there's no reason why I can't survive this one. Until Mom informs me that Jacob Stephenson, my brother's ex-best friend and resident bad boy, is back from his grandmothers after having been gone for the semester. I guess, after you find out your son robbed a gas station, you banish him to the most southern state. Now my ridiculous crush is back in full force and I’m trying really hard to stay away from him. My brother is frustrated that Jacob is home and I'm supposed to put my family above boys. Right? But when he keeps pulling away and acting like the bad boy I'm pretty sure is fake, I begin to realize that there's more at stake here then just my heart. A truth that is eating away at him. I just hope I can unearth it before Christmas is over and any chance that I have at discovering the real Jacob disappears. Best friends and worst enemies pretty much sums up the relationship that Jacob's and Ava'a families have with each other and Christmas is a perfect time to keep the competition alive and well. Jacob has the rap of being a bad boy, but Ava can't ignore the attraction she feels towards him and the feeling she has that there is more to meet the eye where he is concerned. Ava, on the other hand, is innocent and naive. The pull of this opposites-attract, friends-to-lovers chemistry is undeniably sweet, but I wasn't a fan of the way Jacob's family, especially his mother, treats him. I also wanted justice to be served to those who truly deserved it. I felt so bad for Ava--that is NOT how I would have wanted my first kiss to go down. But wowza--what a kiss it was. And that kiss was the whisper of things to come. 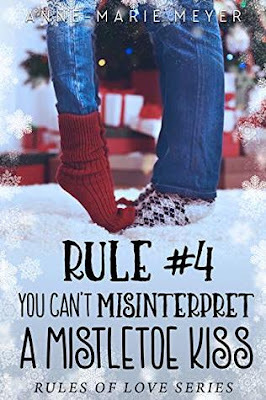 This is a sweet and fun holiday romance, balanced with some frustrating competition and people.